The media is carrying stories of a study in Science showing that Camponotus workers specialize into three behavioral classes, and that workers tend to move through these roles as they age. This result is interesting, but not terribly surprising as a similar pattern is known in the better-studied honey bees. The reason the paper appears in Science, rather than a more specialized journal, is methodological. Danielle Mersch, Laurent Keller, and Alessandro Crespi have automated the observation of an ant colony. Basically, they built the perfect Orwellian ant-watching machine. Each ant is labelled to be recognized by high-resolution video, and her position and social interactions are recorded continuously for the length of the experiment. The technique produces a staggering amount of data from relatively little effort once the initial tedious bits of gluing barcodes on ants are out of the way. Network analyses of over 9 million interactions revealed three distinct groups that differ in behavioral repertoires. Each group represents a functional behavioral unit with workers moving from one group to the next as they age. The rate of interactions was much higher within than between groups. The precise information on spatial and temporal distribution of all individuals permitted calculation of the expected rates of within- and between-group interactions. These values suggest that the network of interaction within colonies is primarily mediated by age-induced changes in the spatial location of workers. The really interesting bits will come later, in my opinion, when the method is harnessed across other species. Assuming the ants don’t first figure out what we’re up to, that is. See also Ed Yong’s “Tracking whole colonies shows ants make career moves” commentary in Nature. Oak tree leafing out at Paynes Prairie State Park. Earlier this month I gave a pair of talks at the University of Florida. The trip was fabulous! In addition to meeting a pile of exceptionally friendly people, I spent time with my myrmecologist friends Andrea Lucky and Lloyd Davis, hunting ants at Paynes Prairie State Park, Austin Cary Forest, and elsewhere around Gainesville. Below, as promised, are a few of my photos from the visit. I’ve posted a larger set to this gallery. Andrea Lucky and Lloyd Davis spot a Cyphomyrmex worker walking across a fire ant mound. Paynes Prairie. Leafcutters are the ant stars of many nature documentaries. 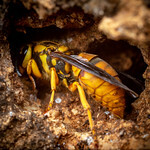 Their most spectacular film appearances, including the nest excavation above, and the relocation of a full colony to a lab for the BBC’s upcoming Planet Ant, involve the destruction and removal of an established colony. Since leafcutters are such dominant players in tropical ecosystems, this practice of destructive filming raises the question of whether we ought be concerned about ant conservation when filming. Most Atta leafcutter species are not only not endangered, they may even be more numerous now than before our species intruded on their territory. Leafcutters, you see, are beneficiaries of human activity. They are a buggy, neotropical analog of North America’s ubiquitous whitetail deer, a species that thrives along forest edges, farm fields, and other places where weedy, disturbance-associated vegetative regrowth provides an abundance of their favorite foods. Cleared soil may also help leafcutters start new colonies. When humans make field from a forest, or build a road, they also make leafcutter habitat. The leafcutters thrive. Atta vollenweideri nests- the white dots- are denser in old farm fields than in the undisturbed adjacent scrub. We humans have been good to leafcutters. 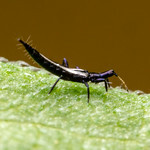 They, in turn, have repaid us by becoming the most economically damaging pest insect in the region. So enjoy your leafcutter ant documentaries, and don’t worry about the fate of the ants. Our environment is faced with far more serious troubles. It’s an Aphaenogaster worker missing the metathorax and the propodeum. The mid-thorax is fused directly to the second abdominal segment, with the effect that the hind legs are just… gone. For comparison, have a look at a normal Aphaenogaster. Myrmecologist Douglas Booher pulled her from a litter sample in Georgia. You’d think a major pair of walking legs would be indispensable, but this ant apparently was collected alive. In this paper, I describe a method based on the burial of a nest constructed of ice. The hollow space that remains after the ice melts is a facsimile of the ant nest as designed by the experimenter. Want to see, in the field, how a colony of ants reacts when introduced to an alien architecture designed by a different species? Or, perhaps you’d like to establish lab-altered colonies in a field experiment without wasting energy on nest construction. Or, maybe you’re just looking for a kinder, gentler way to release pet ants back to their original habitat. Either way, the field-melted ice nest is an elegant technique. source: 2013. Tschinkel WR (2013) A method for using ice to construct subterranean ant nests (Hymenoptera: Formicidae) and other soil cavitiesMyrmecological News 18: 99-102. Plate 105 from Sarnat & Economo 2012, just one of many clean, clear illustrations. In particular, notice that the 1921 paper is full of new species descriptions, while the newer monograph refrains from describing a single new ant. It’s tempting to think the earlier work cleared most of the descriptions out of the way, accounting for the difference. But chronology is not it at all. Sarnat & Economo include a stack of undescribed ants (see the Poecilomyrmex, for example), so they had ample opportunity to follow Mann’s lead. Instead, this modern taxonomic caution has become the norm. It’s a cultural change in the intervening 90 years as taxonomists adopted the Darwinian synthesis. Biologists as a group are more focused on underlying evolutionary processes, rather than simply describing observed diversity. Increasingly, taxonomists leave descriptions of new species to more detailed studies of particular lineages on a global scale, often in conjunction with a phylogeny. Thus, species are described in global monographs focused on particular genera or species groups. We see new species in revisions of the Ants of Genus X, rather than in papers on the Ants of Region Y. The deciduous forests of New York's finger lakes region turn brilliant in mid-October. Canandaigua lake runs north-south in the background. On Monday we dropped by a favorite childhood insect collecting spot, a woodlot atop a hill in upstate New York. The habitat is a mix of mature oak and second growth maple forests surrounding an open field maintained by seasonal mowing. Over the years I’ve recorded around 35 species of ants, including some gems: Stigmatomma dracula ants, Polyergus amazon ants, Formica thatch-mound ants, Temnothorax acorn ants, and others. I have yet to find a single non-native ant. It’s a pretty special place, and one I was happy to revisit. Mid-October is the end of the season. With the autumn flights of Myrmica & Lasius the year’s last ants have mated and above-ground activity dwindles. Below ground, though, some species remain busy. I spent a couple hours looking under stones and logs, curious about the late-season ants, finding a surprising amount of activity from one species in particular: Lasius nearcticus, a common but poorly-studied subterranean ant. Below are photos of these attractive yellow ants, along with photos a few others. Lasius nearcticus with eggs and young larvae. Given the prolific rate of fall egg-laying, colonies must overwinter with eggs.